Throughout history, from Midas to Hip Hop stars, gold has attracted humanity. In the Bronze Age metal smiths would forge golden swords. They were utterly useless as weapons because gold is such a soft metal, but they gleamed and spoke of wealth maybe even magic. Gold decorated burial chambers, grave goods, ritual deposits and no doubt many homes and public buildings too. If done right, gold can add a feeling of wealth to a home in both literal and visual terms. In a world of economic and geopolitical uncertainty, investors turn to reliable, long-term investments and safe havens. In this, someone using physical gold to decorate and improve a property is investing in 2 of these key safe havens. These are precious metals such as gold and real estate. As Lear Capital demonstrate, the price of real, physical gold be it as part of an antique or in solid gold form such as a gold coin or a piece of bullion, will rise in value as stock markets and even gold stock falls. Buying gold for your home when the economy is good insulates you in case the economy goes bad. Naturally, tastes vary from home to home and designer to designer. The level of gold’s involvement in an interior design can range from dripping opulence with gold everywhere to be seen to subtle hints of gold. However, it is worth remembering that as an investment, only real gold secures the value of a design or item. The best investments are to be found in solid gold pieces and especially in antiques featuring verifiable gold elements. It is possible to weave real gold into the architecture of your home, however, the value it adds to the home will be less than if you had it separate as something you could sell individually. 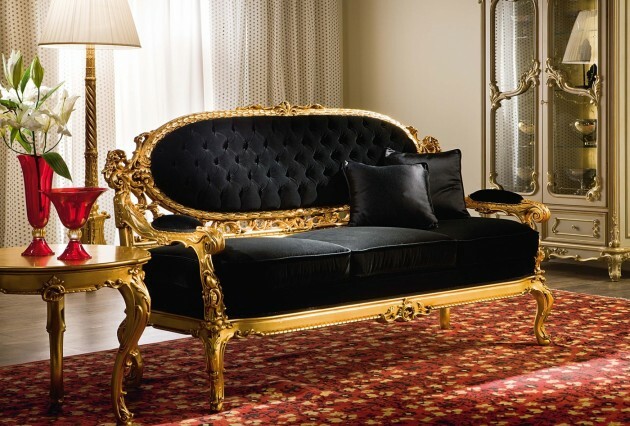 If you are going to use antiques, including pieces of gold or items with gold elements, you do not have to design a home which matches in terms of age or an old style. Sometimes eclectic lifestyles can forge an identity of their own. Things that should not mix, work together somehow for example mixing Japanese shoji screens with 18th century porcelain. You never know until you try. In addition to this, if done in the right way, an antique can add a touch of class and depth to an ultra modern interior just as a slice of modernity can add something new to an old one.